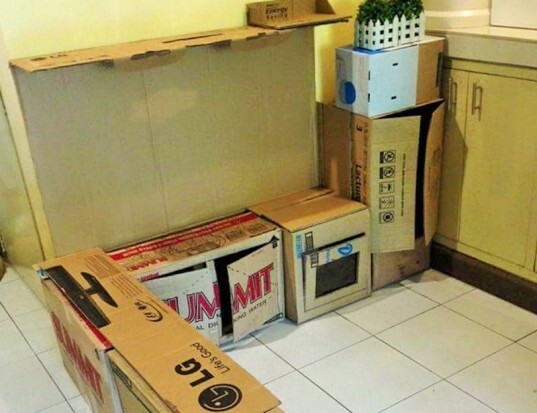 Need more proof that cardboard is the perfect, upcyclable material? 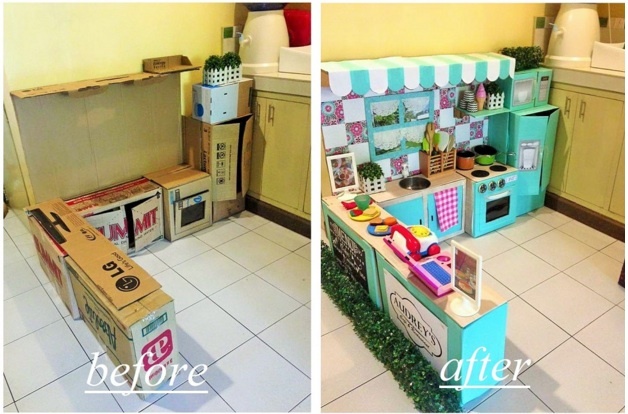 Check out this dreamy play kitchen that a mom from the Philippines created for her daughter by using recycled cardboard and other materials that are typically destined for a trip to the old trash bin. The colorful, cheerful play kitchen is the ideal hang out for 1 year-old Audrey, and we'll show you the project in several steps to get you inspired to make this eco-friendly play kitchen with your own family. Despite the impressive final product, the play kitchen requires little more than cardboard, some paint, and your imagination and creativity. Rodessa and her husband first created an L-shaped play kitchen using large cardboard boxes. They marked on the boxes where they wanted cabinets, doors, and an oven that can open and close. Later they cut these lines into functional openings. Little Audrey didn’t even need to wait for the finishing touches to get cooking in her new kitchen! Next they painted, added stickers for a backsplash and for extra features on the fridge and microwave, created a simple and sweet “window” (complete with doily curtains), and personalized the space with an “Audrey’s Cafe and Restaurant” sign and a menu chalkboard. The finished play kitchen is too cute, and we especially love the eco details that Rodessa incorporated into the design. The faucet is actually a recycled top of an empty soap bottle, the sink is a pre-owned, round metal pan, the oven range switches are jar lids, and the accessories such as utensils and pans were already part of the family’s playtime repertoire. There are even potted plants for adding a little green to the kitchen. Another aspect we love is how you can modify this play kitchen in so many ways: choosing fewer boxes if you have less space, building vertically to create an area that older, taller kids will want to play in, adding internal shelving, or simply picking a different color scheme. Rodessa told Inhabitots that she is overwhelmed with the comments and appreciation from moms and dads around the world in response to the play kitchen. She originally made the play kitchen for her daughter’s amusement since she loves to pretend she is a chef. Audrey has a lot to live up to: Rodessa is the entrepreneur behind Ava’s Kitchen, a culinary business which purportedly sells the first lactation cream cheese spread in the Philippines for nursing moms. Now, however, Rodessa wants to continue inspiring moms and dads to create DIY toys for kids. A cardboard workbench is in the works for her nephew so look out for another cardboard wonder on the way. Rodessa and her husband first created an L-shaped play kitchen using large cardboard boxes. They marked on the boxes where they wanted cabinets, doors, and an oven that can open and close. Later they cut these lines into functional openings. As you can see, little Audrey didn't even need to wait for the finishing touches to get cooking in her new kitchen! Next they painted, added stickers for a backsplash and for extra features on the fridge and microwave, created a simple and sweet "window" (complete with doily curtains), and personalized the space with an "Audrey's Cafe and Restaurant" sign and a menu chalkboard. The finished play kitchen is too cute, and we especially love the eco details that Rodessa incorporated into the design. The faucet is actually a recycled top of an empty soap bottle, the sink is a pre-owned, round metal pan, the oven range switches are jar lids, and the accessories such as utensils and pans were already part of the family's playtime repertoire. There are even potted plants for adding a little green to the kitchen. Another aspect we love is how you can modify this play kitchen in so many ways: choosing fewer boxes if you have less space, building vertically to create an area that older, taller kids will want to play in, adding internal shelving, or simply picking a different color scheme. Rodessa told Inhabitots that she is overwhelmed with the comments and appreciation from moms and dads around the world in response to the play kitchen. 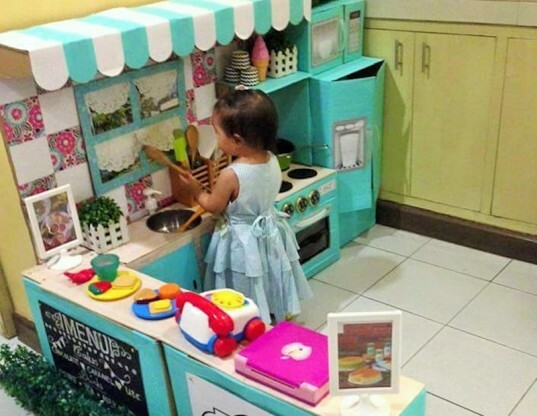 She originally made the play kitchen for her daughter's amusement since she loves to pretend she is a chef. Audrey has a lot to live up to: Rodessa is the entrepreneur behind Ava's Kitchen, a culinary business which purportedly sells the first lactation cream cheese spread in the Philippines for nursing moms. Now, however, Rodessa wants to continue inspiring moms and dads to create DIY toys for kids. A cardboard workbench is in the works for her nephew so look out for another cardboard wonder on the way.